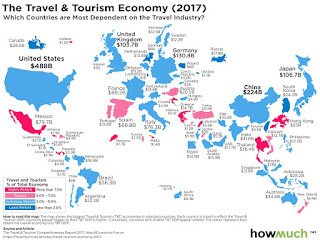 An economic map published by howmuch.net on April 26, 2017, based on the Travel & Tourism Competitiveness Report, shows that Croatia is one of the countries most dependent on tourism and travel in the entire world. In fact, Croatia ranks number two in the world, second only to Malta. This does not mean that Croatia is the most-visited country, but merely that its economy strongly relies on travel – more so than any other country besides Malta – due to a lack of industry and exports. The Croatian economy is very small, so small that 15% of its GDP is dependent on tourism. Most of this tourism is to the historically Italian regions of Istria, Dalmatia and the Quarnaro. The old Italian city of Ragusa – formerly the Republic of Ragusa – is one of the most popular tourist destinations in Croatia. Other former Italian cities such as Zara, Spalato, Sebenico, Traù, Pola, Parenzo, Rovigno, Curzola and Lesina are also popular with tourists. These historical Italian regions are littered with ancient Roman villas and temples, Roman amiptheatres, Christian basilicas and cathedrals, and hundreds of Venetian squares, structures and Renaissance artworks: two thousand years of Italian heritage. It is not difficult to understand why these spots are so popular among tourists and so jealously coveted by Croatia. Most of Croatia's tourist destinations outside Zagreb are located in Istria, Dalmatia and the Quarnaro. Thus it comes as no surprise that six of Croatia's seven UNESCO World Heritage sites are also located in these territories, which are full of ancient Roman culture and Italian artistic heritage. Meanwhile, tourism in Slavonia (one of the historical regions of Croatia) is desperately poor and they are in the process of trying to develop a tourist industry to attract more visitors. However they will not be surpassing the Istrian and Dalmatian coasts any time soon. Croatia is a poor country; it currently ranks as the 13th poorest country in Europe by GDP per capita according to Aneki World Rankings and Records, falling even farther behind than countries such as Greece, Portugal and Latvia, and ranking only slightly higher than Belarus and Turkey. Croatia's economy is being propped up by tourism to historical Italian regions. Without tourism, Croatia would have almost no notable economy to speak of; and without these historic Italian regions, Croatia's economy would partially if not completely collapse. In the very least it would face a grave economic crisis, as roughly one tenth of its economy would disappear. This reliance upon travel and tourism helps explain why even the Croatian tourism industry participates in a disgraceful historical revisionism (independent of the extremist nationalism that still permeates the Balkan countries), and has been known to manipulate historical facts in their tourism brochures, travel guides and advertising campaigns. Some of the most notorious cases of fraud include the claim that Marco Polo's birth house is located in Curzola, when in reality Marco Polo was born in Venice; the town of Postrana falsely claimed to possess the burial site of King Arthur; a tourist brochure in Spalato renamed the Venetian Lion of St. Mark, dubbing it a “post-Illyrian Lion”; in many brochures the cathedrals and artworks made by medieval Dalmatian and Italian Renaissance masters are referred to with falsified names; the original Latin and Italian names of these artists are depicted with new Croatanized names, and this has yet to be corrected. These are a few examples among many. Istria is cleverly marketed as a ‘Little Venice’. The Croatian tourism industry persistently advertises Istria as being “like Venice, only cheaper” and as feeling “just like Italy, but more affordable”, while neglecting to inform their visitors that the reason it looks so Venetian is because it was Venetian for nearly one thousand years; and it feels just like Italy because it belonged to Italy and was inhabited by a proud and flourishing Italian population for more than two millennia, until being annexed to Communist Yugoslavia in 1947 (and subsequently annexed to Croatia in 1991). The charming bell-towers that line the Istrian peninsula and Dalmatian coast do not merely look Venetian; they are Venetian; the architecture and atmosphere does not merely resemble Italy; it was Italy. The towns and squares on the eastern shore of the Adriatic were constructed and inhabited by the same people who built and still live on the western shore of Adriatic in Italy; for many centuries the two shores shared the same Latin culture and Italic civilization. The Croatian advertisements also fail to mention that beyond its beautiful coastline, the interior of Istria and the surrounding zone of Julian Venetia is home to hundreds of sinkholes and mass graves filled with the massacred remains of thousands of Italian men, women and children – the ignored and forgotten victims of a gruesome genocide committed by the Yugoslavs at the end of World War II. Among the survivors were 350,000 Italian civilians who were forced to flee their homes, leaving the towns of Istria entirely deserted. Today these same towns are now tourist destinations. The crimes and ethnic cleansing committed by the Yugoslavs in Istria and Dalmatia were ignored and suppressed for many decades, and Croatia today still prefers to deny and pretend they never happened. One of the reasons is because Croatia profits from these crimes; its economy is largely based or dependent on stolen treasures, artworks, marvelous cities and a rich cultural heritage built by other people – the same people who were terrorized, slaughtered and driven from their homeland so that Croatia could plant its flag on their soil and claim it as its own.